After 72 years, a marine killed in World War II is finally back in the land he once served, reports WUSA 9. Private Robert Carter was killed on the first day of the Battle of Tawara, an island the marines took three days to capture despite a Japanese commander saying that it would take a million men 100 years to capture Tawara. 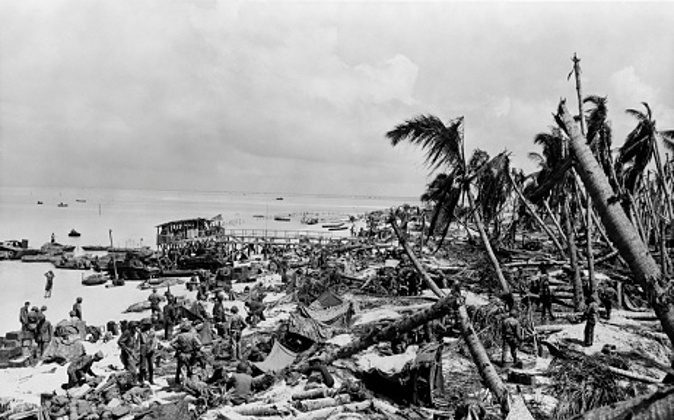 The then 18-year-old Carter, who was likely killed by an artillery shell hitting his landing craft or while wading ashore, was buried along with hundreds of other Marines in trenches on the atoll in the remote Gilbert Islands. He was there 72 years before, a charity dedicated to bringing those killed and missing back to their homes, found Carter’s remains under feet of crushed coral near Red Beach One. “I wouldn’t want to be left behind. I wouldn’t want my buddies to be left behind,” John Frye of History Flight, a retired Green Beret medic, told WUSA9. Carter’s remains were bought back to U.S. soil on Thursday July 14. Most of Carter’s extended family were no longer alive to hear the news of his homecoming; Carter’s parents, as well as four of his brothers and sisters, have already passed. But Joan Marie Nusbaum—Carter’s younger sister who was 5 years old when her brother died—flew from Oregon to see her brother buried with full military honors at Arlington National Cemetery. “Now we know he’s at rest,” Nusbaum said. Along with Carter, History Flight found 34 other marines buried in the same row of beach as Carter. The Defense department is helping to identify and eventually also bring home the other remains. Marines from the Battle of Tarawa who remain lost and far from home number around 500.